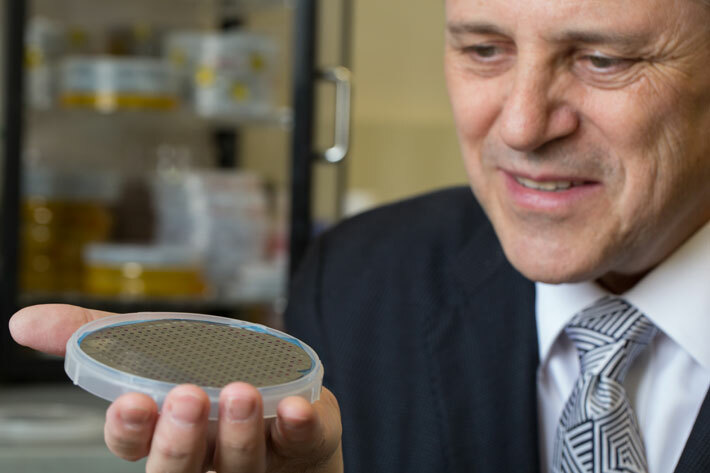 Dr. Vertes holds a silicon wafer containing multiple the REDIchip devices, a new device that can detect ultratrace amounts of chemicals. WASHINGTON (June 17, 2015)—A George Washington University professor has designed new technology that can identify traces of chemicals at 10-19 moles, a previously undetectable amount. This minute quantity can be conceptualized as 10 times below a billionth of a billionth of a teaspoon of water. Akos Vertes, professor of chemistry in the GW Columbian College of Arts and Sciences, invented the technology behind the REDIchip (Resonance-Enhanced Desorption Ionization) as part of a project aimed at reducing the amount of time needed to identify biological and chemical matter. While the project was conceived to help identify potential chemical and biological threats, the technology has the ability to assist in multiple fields. The REDIchip can detect drugs in urinalyses, provide earlier detection of emerging health problems, enhance medical imaging, improve tumor margin determinations and identify endocrine disruptors in the environment. The REDIchip, commercialized by Protea, will be available for purchase beginning next month. The technology was invented and commercialized with funding provided by the U.S. Department of Energy and the Defense Advanced Research Projects Agency (DARPA), respectively. Part of this research (fundamental studies) was supported by the Department of Energy, Office of Science, Office of Basic Energy Sciences, Chemical Sciences, Geosciences, and Biosciences Division under Award # DE-FG02-01ER15129. Other parts of the research (commercialization) were sponsored by the U.S. Army Research Office and DARPA and were accomplished under Cooperative Agreement Number W911NF-14-2-0020. The views and conclusions contained in this document are those of the authors and should not be interpreted as representing the official policies, either expressed or implied, of the Army Research Office, DARPA, or the U.S. Government. The U.S. Government is authorized to reproduce and distribute reprints for Government purposes notwithstanding any copyright notation hereon. • Click here for photos of Dr. Vertes and the REDIchip.